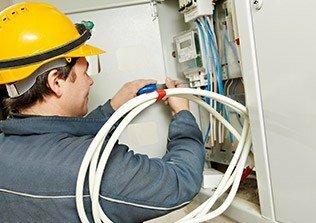 At E J Lack Electrical our years of hands-on experience, combined with clear prompt communication, makes us the best team in Melbourne’s Inner East to work in conjunction with you, for all electrical aspects of your commercial office fit out and electrical installation. Our expertise ensures that we can work with a clean slate or an existing office, ensuring your new office fit out, both meets your expectations, and complies with industry standards and regulations. Thanks to our innovative and professional electrical solutions we can transform a bland and impractical space into a modern and highly-functional office. By seamlessly installing energy-saving LED lighting, high-bandwidth Cat6 data cabling, and even the installation of commercial soft wiring for individual desks we can bring your workspace into the 21st century. If you want to upgrade your commercial space, our personalised new office customisation is just what you need. E J Lack Electrical delivers efficient and detailed office customisation that is performed at an opportune time for minimal interruptions to your daily operations. Covering everthing from the installation of new lighting fixtures to laying data cabling and wiring our new office customisation ensures that your space meets your businesses requirements. No matter the size of your business or how old the property is, we have experience working on any type of building!